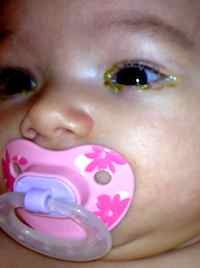 My 2 month old daughter’s eyes have had a yellow discharge since birth. Our pediatrician said it is a “clogged tear duct”. He prescribed antibiotic drops and encouraged us to massage her tear ducts but they are not improving. What else can we do? Clogged or blocked tear ducts simply take time to get better. Most cases resolve between 6 to 8 months of life. I do not recommend antibiotic drops or massage for blocked tears ducts as neither have been shown to help. I would recommend you use a warm wet washcloth to wipe out the discharge and wait. Typically, the discharge will come and go and is usually worse when she has “cold” symptoms. If your daughter still has symptoms at 12 months, I would recommend she see a pediatric ophthalmologist.